In the ’50s and ’60s, Irene Kral recorded with Maynard Ferguson, Herb Pomeroy and Junior Mance, but remained in the shadow of her older brother, singer-pianist-arranger Roy Kral. 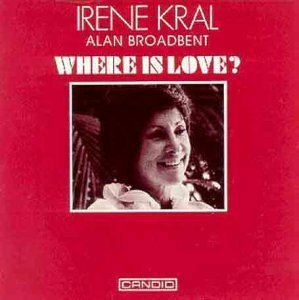 Where Is Love?, a 1974 collection of duets with pianist Alan Broadbent, was her creative breakthrough and, sadly, her artistic testament. Kral, who died in 1978, considered this long out-of-print album to be “the definitive example of my work.” The original LP surfaces were notoriously noisy, marred by distracting pops and ticks, which makes this Candid CD reissue doubly welcome. Kral’s interpretations of 11 meticulously chosen ballads (including “Spring Can Really Hang You Up The Most,” the Tommy Wolf-Fran Landesman standard introduced by Kral’s sister-in-law, Jackie Cain) are masterfully restrained, with minimal ornamentation and a refreshing absence of theatricality. Her vibrato-free, exquisitely controlled and sustained tones are lovingly embraced by Broadbent’s equally spare, harmonically felicitous keyboard settings. Where Is Love? earned Kral a Grammy nomination and has inspired a generation of aspiring singers. (In the liner notes for her new Shanachie CD, My One And Only Love, Megon McDonough writes “This album is the music of my soul and to this day is a sort of meditation for me.”) The incomparable Carmen McRae, Kral’s idol and friend, rightfully observed, “Anyone who loves beauty should have this album.” A vocal classic.